When people talk about the best, most perfect movies ever made, we all know the usual suspects: Citizen Kane, Chinatown, Casablanca. And I feel like Back to the Future should absolutely be on that list. The way this film is structured and feeds story to the audience is so seamless, it’s basically a clinic in how to make a movie. First of all, it’s amazing to realize that the entire Back to the Future trilogy is basically a character-based saga. With the possible exception of the dystopian alternate timeline in the second movie, this series keeps its stakes very low and personal for Marty McFly. Throughout all three movies, his main goal is to ensure his own continued existence, but also to save his family—and to a large extent, a lot of the “action” in these films is in the service of character development. The narrative payoff is always in the form of the main characters changing. And just consider how much information the movie packs into its opening minutes. The movie starts with that famous long take inside Doc Brown’s bizarre lab. Immediately you have an idea of who this guy is: He’s a bit cuckoo. But there’s more too. There’s foreshadowing, in the form of a man hanging from a clock that looks like the end of the movie, as well as plot development, with the newscaster telling us about the stolen plutonium. We’re then introduced to our main character, Marty McFly, and the shot ends with a skateboard hitting the plutonium, an act that tells us a ton about this wild kid and this person whose place we’re in. That’s all in THE FIRST SHOT OF THE MOVIE. The scene continues and we get a bit more of who Marty is. He’s a rocker, kind of a rebel—and Michael J. Fox’s twitchy, squinty-eyed performance does a great job of selling Marty’s insecurity and constant state of hapless panic to the audience. And then Doc calls and sets up their first meeting, which will happen later in the film. Next we find out the clocks are slow, which means Marty’s late for school. So where does he go next? School, perfectly moving the story forward, while also telling us he’s not exactly a model student. Huey Lewis and the News’ “The Power of Love” kicks in as Marty rides his skateboard on the back of a few cars through the center of Hill Valley. This scene gives us a more of an idea of who Marty is and also introduces us to an area we’re going to get very, very familiar with over the next three movies. The scene also features a glimpse of Goldie Wilson as mayor, another bit of foreshadowing. Marty arrives at school and we meet his girlfriend, Jennifer. She’s totally on his side and tries to sneak him into school safely, but they run into Mr. Strickland. He over heard Marty talking about “Doc” Brown, and starts to bad mouth him. We haven’t seen Doc yet, but we already know a lot about him and what people think of him so we’ve formed a mental image. Strickland also tells Marty he’s a slacker like his father, something we’ll come to learn more about later in the movie. He says that “No McFly has ever amounted to anything in the history of Hill Valley.” That, in a way, is hinting at what happens in the third movie more than anything, but also is about how his father will change over the course of the movie. Strickland, a character we’ll also see later, then mentions Marty’s band, which transitions us right into the next scene. Marty’s band, The Pin Heads, is auditioning for the dance. Jennifer watches on proudly—but they’re rejected, something we already know is a McFly trait. It also puts a cap on a storyline set up in the previous scene. The rest of the school day is then skipped, probably because nothing happened of significance, and we go to Jennifer and Marty walking through the town square again after school. This scene is absolutely stuffed with information, but also pushes the story forward. Marty and Jennifer discuss the band audition. He says he doesn’t think he’s ever going to get to play in front of people, which of course happens later, and that he can’t handle rejection. In that instance Marty quotes his father, something that will becoming immensely important later in the movie. While this is happening, we see a table with the “Save the Clock Tower” flyers, and the conversation ends with them standing on a bench with that same clocktower in the background. So even if you don’t know how important that structure is yet, subconsciously, you are already figuring it out. As the dream Toyota 4x4 drives by, something that also pays off later, Marty and Jennifer discuss him lying to his mother. He says he thinks she was “born a nun.” Later we’ll learn Lorraine’s lack of experience wasn’t due to a lack of desire, so Marty saying this is actually setting up and confirming his mother’s regret-filled life. That’s heavy. Just as the couple is about to kiss, the clocktower lady interrupts them. She drops a ton of important exposition about the history of the structure, which we don’t yet realize is crucial, and hands Marty a flyer. That flyer is arguably the most important thing Marty gets in the movie, but he needs a reason to hang onto it, right? Well, Jennifer writes her grandmother’s number on it as she leaves. He looks at her longingly, and just as they kiss, “The Power of Love” reprises, bringing us right back to the first scene of the movie. That’s the first 12 minutes of Back to the Future. Twelve minutes. Every single action has a purpose, every piece of scenery has a reason. The dialogue sets up plot, moves the narrative, character is built throughout—and we still don’t even really know what the movie is about. You could write a whole book analyzing the way this level of filmmaking precision continues throughout the movie. Not just from scene to scene, but shot to shot. But you didn’t come here to read a book. So here are a few of the bigger highlights. Lorraine talks at the dinner table: As the 1985 McFlys sit around the table for dinner, Lorraine lays out the entire second act of the movie. She talks about how she was with boys and how if her father had never hit George with the car, none of the kids would never be born. Which almost happens. She then goes on to reminisce about the Enchantment Under the Sea Dance and, the brilliance here, is the script makes what feels like exposition to the characters absolutely crucial to the movie. We’re learning what Lorraine was like as a teenager, we’re setting up several plot points that’ll get picked up again later—and it’s all being delivered as if some drunk old lady is just telling her favorite story, which is in keeping with this version of Lorraine. She asks George if he remembers that the dance took place the night of that terrible thunderstorm. Check. Asks him what he was doing in the middle of the street, check, and, in a very melancholy way, says she knew she was going to spend the rest of her life with him. Check. George, in this timeline, ignores her, and both of their attitudes in this scene serve as great jumping off points for the changes that happen to each character. He’ll come to appreciate her, and she’ll come to be happy. The Einstein Experiment: When Marty finally meets the Doc and sees the DeLorean, he’s very confused. So are we. But after Einstein travels into the future one minute, Doc Brown explains everything about the car in perfect detail: the Flux Capicator, the time circuits, 88 mph—and it’s all given urgency by the fact we, along with the character, just saw something amazing for the first time. Eventually, he starts to remember how much has changed in this area. That leads him to talk about how Old Man Peabody used to own all of this land and he had a crazy idea about breeding pine trees. It’s basically just a man going off on a tangent, a telling character trait, but it’s also information that gives the following scene more creditability. Marty soon arrives in 1955 on the Peabody’s land and destroys one of his pines. This comes back at the end as the name of the mall has changed from Twin Pines, to Lone Pine. But wait there’s more. Before Doc is gunned down, he mentions the plutonium needed, check, and how, by traveling into the future, he’ll be able to see who wins the next 25 World Series. Part II will let us know about one in particular. The Photo: Once in 1955, Marty has to convince Doc that he’s telling the truth about being from the future. One of the examples he uses is a photo from his wallet of he and his siblings. His sister is wearing a shirt that says “Class of 84.” Doc waves it off, saying its obviously a fake because it cut off his brother’s hair. So, buried in this desperate plea between our leads, is our first clue that bad things have already been set in motion. A few scenes later, when Marty tells Doc he’s already seen his parents, Doc remembers the photo and we remember what he said about it. Marty’s brother is now missing his head and the film has just set up, and solidified, its own internal ticking clock. Clock motif achievement unlocked. Marty has until this photo disappears to avoid being “erased from existence.” There’s Marty’s secondary goal for the movie, while Doc works on the primary one. The Diner Scene: When George first asks Lorraine out in the Diner, it sets off a fantastic action scene that’s filled with moments that work so well because they’ve already been hinted at. We know Biff likes Lorraine along with George. We know Biff and Marty already have some beef. Once Marty challenges Biff and rushes outside, we already know the area quite well as the movie has taken us through it numerous times. Marty’s skateboarding skills have already been established, as has the fact that Biff isn’t a great driver. Everything down to Lorraine calling Marty a “dream” has been set up beforehand, giving what’s an otherwise crazy scene that much more grounding. It goes on from there too. The scene ends with Lorraine saying she’s going to find out where Marty lives, perfectly leading into what’s next. And who could forget this entire scene is replayed later in 2015? Doc’s Plan: Speaking of the next scene, that next scene in Doc’s house basically resets the movie. We’ve been following George and Lorraine around and may have forgot about the primary story of getting back to 1985. Doc, thankfully, hasn’t and lays out his role in the third act for us, using a model. Just then, Lorraine arrives and her honestly telling Marty what she wants in a man not only gives Marty the idea of how George can win her over, it lets us know why she and George are so, so much more in love in the new 1985 at the end of the film. It’s because, through Marty, George has reached his full potential, as has Lorraine. The Dance: The narrative drive at the Enchantment Under the Sea Dance is almost unfair, it’s so perfect. Marty and Lorraine arrive. She’s drinking, which she does in the future, and Marty scolds her about it. Since Biff got his car wrecked in the skateboarding scene, he has a reason to take out Marty. And because Marty isn’t actually being in the car, this gives George the opportunity to finally stand up to Biff—which, in turn, makes Lorraine fall for him. And that should be the end of it, but it’s not. The film adds complication after complication at the end to raise the stakes exponentially. Lorraine and George are together, but because Marty got taken away by Biff’s goons, Marvin Berry hurt his hand. Marvin’s hurt hand means that the dance is going to end, so Marty’s parents won’t kiss and Marty will disappear. Marty then has to finally step up and play in front of people, a goal mentioned almost 90 minutes prior, in order for his parents to kiss and make things okay. Which he does. But, of course, things aren’t okay. Doc has problems with the wire, Marty has to save Doc, and then once that’s all figured out, Marty’s 1985 is totally transformed. And then there’s that amazing ending. In Back to the Future, there’s not a single wasted scene. Not a single wasted word of dialogue, action, or piece of set dressing. It’s all there in service of one of the best, most well-structured stories of our time. And that’s why we still celebrate it today. Also the best trilogy. And the Back to the Future trilogy is also arguably the best movie trilogy ever, because it avoids the “third movie” problems that other movie trilogies tend to have. Back to the Future Part II manages to be two sequels in one, exhausting the two most obvious ideas for a second and third movie—going forward 30 years instead of backward 30 years, and revisiting the events of the first movie. And because Back to the Future Part II manages to cover so much ground in terms of obvious sequel territory, it leaves the field open for Part III to do something completely, amazingly different. Part III avoids all of the usual traps of trying to “top” the first two movies, but it also stays tightly focused on the town of Hill Valley, and the relations between the McFly family and the Tannen gang. Instead of doing a “bigger and better” sequel or spinning off in some other direction and going to visit King Arthur or whatever, Part III gives us a sweet, character-based story in which the focus is as much on Doc falling in love as it is on Marty’s problems. 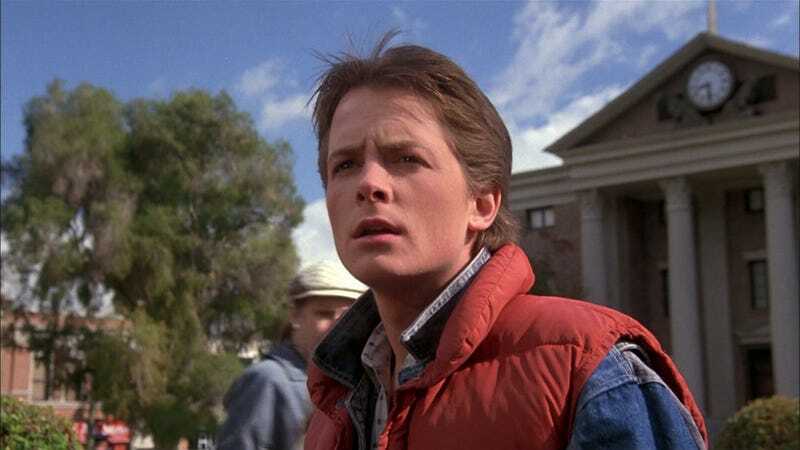 The other thing that’s great about the second and third BTTF movies is the way that they build a character arc for Marty that’s barely touched on in the first movie—in the original film, his main superpower is running away, usually on his skateboard. But his triumph in the first movie is getting his teenage father to stand up to Biff. But his biggest challenge, as a character, in the next two movies is not learning how to stand up for himself, but rather getting over his fear of being seen as a coward. In Part 2 we see how peer pressure (and the kneejerk reaction to being called “chicken”) have ruined Future Marty’s life, and in Part 3 Marty sees for himself the tombstone he’s going to have if he keeps being prey to these tendencies. So while the first movie is more about Marty engineering a massive change in his parents’ characters, the second and third movies are all about Marty himself having to change. And in their own way, the sequels are just as great an accomplishment as the first Back to the Future.